For a Limited Time Only from Bradly Brown on Vimeo. Escape Plan from Bradly Brown on Vimeo. Attention Retention from Bradly Brown on Vimeo. For a Limited Time Only is a critical investigation of the manipulation of our inherent animal instincts that define us all. These basic behaviors have developed in humans over millions of years of evolution. Instincts that evolved through, failure and success, desire and necessity, luck and capability, which all play a significant role in the simple driving force of survival. Considering our most elemental needs; air, water, food, and shelter, it takes very little to survive. However, countless outside variables and interjections have made the means and modes of survival a very different game than what nature originally intended. This exhibition provides a review of modern day survival. By creating a historical lineage that traces a line from early evolution to modern technological developments, the audience may begin to understand how we have arrived at our present-day social framework. 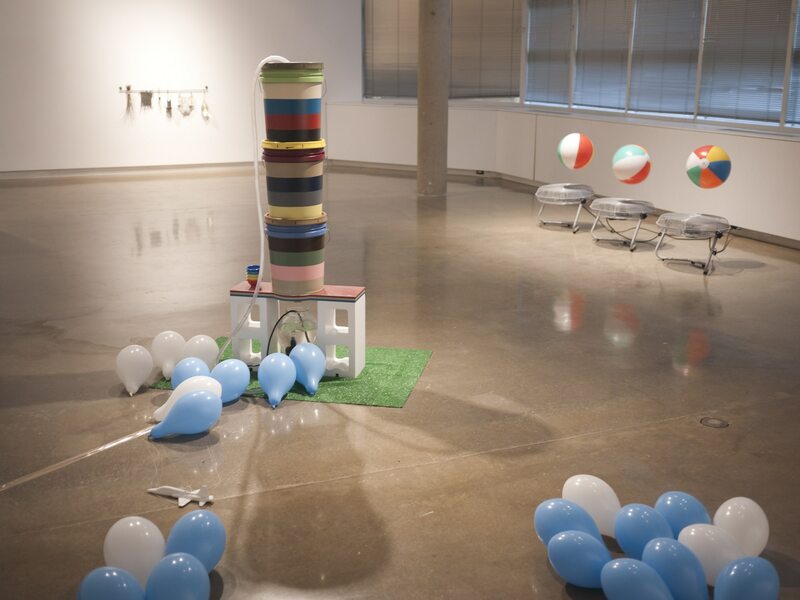 The exhibition is not meant to answer any questions, or evoke a specific emotional response; it is only meant to expose connections and encourage a dialogue around our social norms and tendencies. We live in a fast moving world driven by media, information and communication. We are so removed from the forces that originally shaped our methods for decision making that we have stopped questioning what we are progressing towards. These themes are illustrated in the piece “Diamond Crash” This work is the linchpin in the show since it displays the ideas of attention as well as the pack-mentality within our social structure. This is a direct development to promote survival within a group; there is power in numbers, we are a communal animal. However, it can also be disastrous if left unquestioned. “Diamond Crash” was a definitive example of the human behaviors that play a significant role throughout the exhibition. For example, the Thunderbirds crashed because they had been trained to stay in formation. They were simply reacting to the situation based on what they were taught to do. Their complete and total attention was devoted to basing their maneuvers off the lead plane. 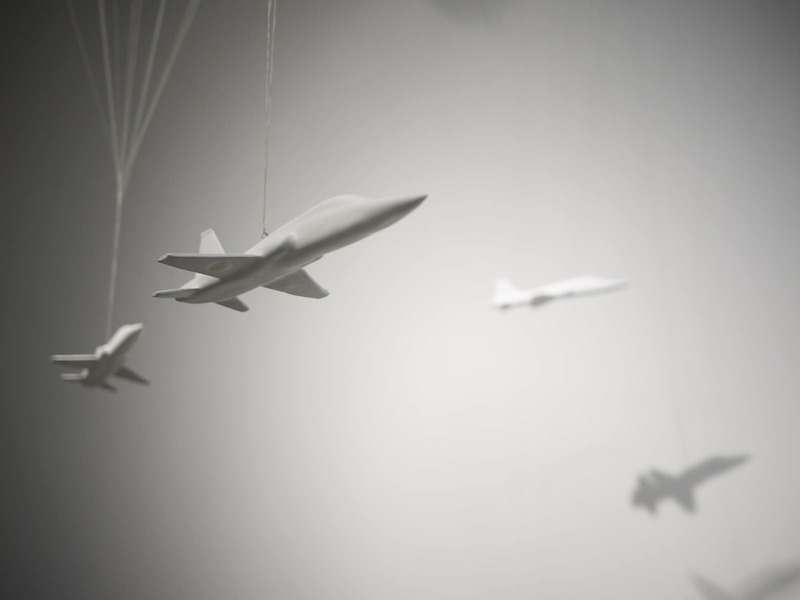 The work consists of four plastic-cast T-38A Talons, the same model plane used by the Thunderbirds. 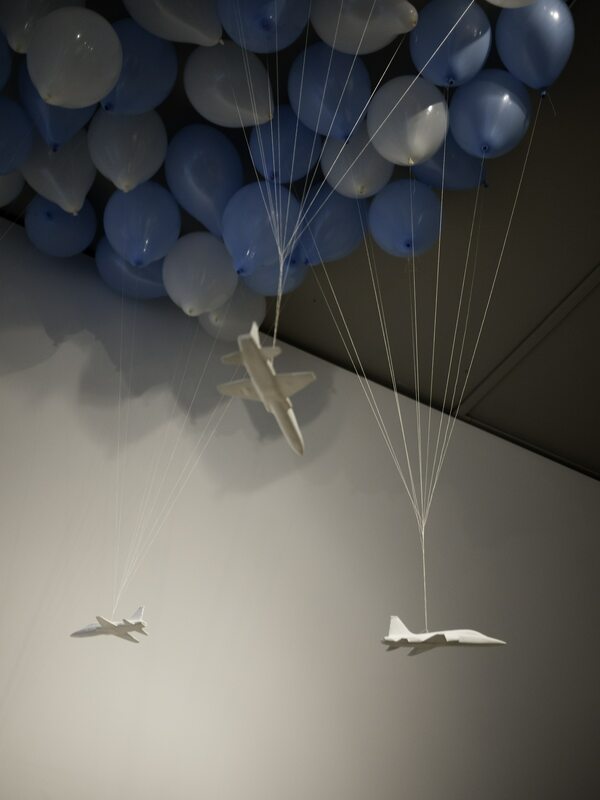 The planes were suspended in mid-flight using blue and white helium filled balloons. 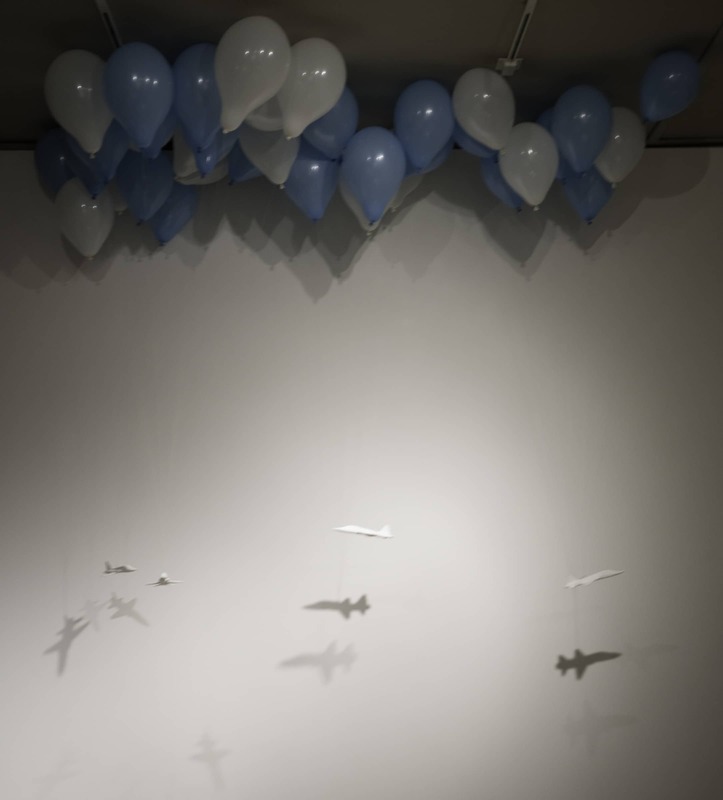 Throughout the week-long exhibition the balloons slowly lost their helium, and the planes descend to the ground. In a group mentality, the many act as one, following the direction of a motivator or instigator. When a trend develops the individual stops questioning the action and accepts it as routine. The helium that kept the planes afloat in “Diamond Crash” is a non-renewable resource that we are expected to run out of by the year 2040. Our usage of natural resources is similar to the follower-the-leader decision making of the Thunderbirds. Once we become accustom to a behavior, we stop questioning it, we continue on the same path because it is what we have been taught to do. By the time we see the ground: it will be too late. One of the most significant events that progressed human evolution was the discovery and control of fire and it’s accompanying light. The first solid evidence of the human use of fire is in Eurasia as early as 790,000 years ago. Fire provided protection from predators and insects as well as extending activities past daylight hours; this helped build communities and improved socialization. Cooked food also allowed for easily digestible proteins that promoted larger brain growth in Homo erectus and a more efficient use of energy. 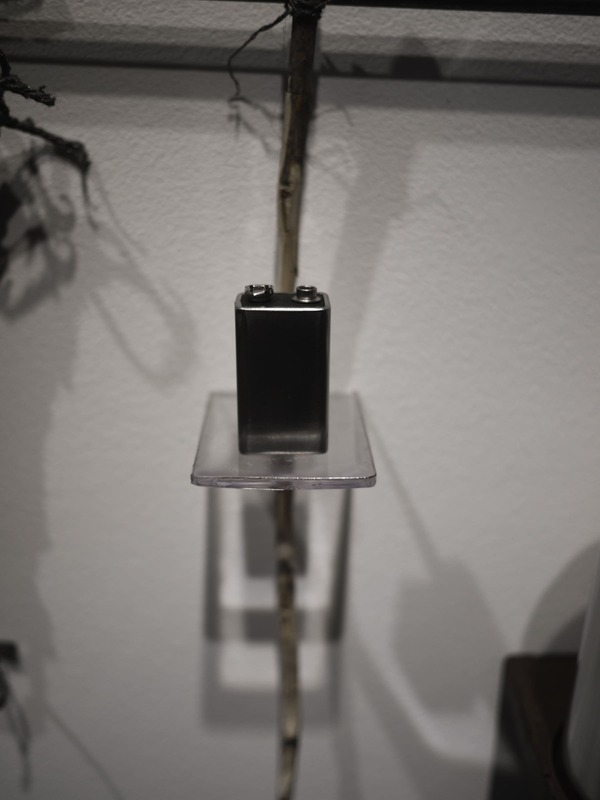 This impetus for rapid growth in human evolution, and tool for survival, is captured in the exhibition through the piece “Several Ways to Start a Fire”. In this work, the selected materials reflect several techniques used by survivalists to create a fire in an emergency situation. 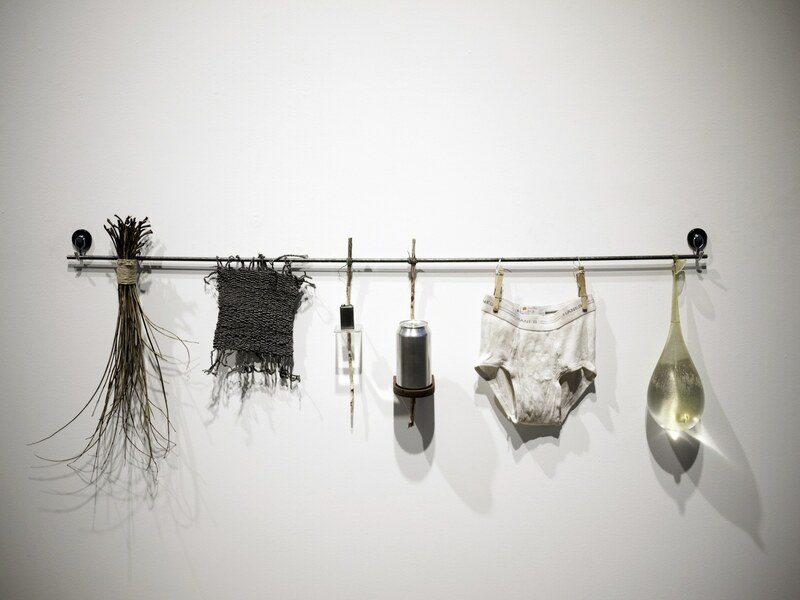 “Several Ways to Start a Fire” is an assemblage of objects that may seem unrelated to one another; twigs, rope, steel wool, a 9V battery, a magnifying glass, an aluminum can, chocolate, cotton underwear, close pins, and a condom filled with water. All the materials have been altered in some way to further remove them from their intended use. 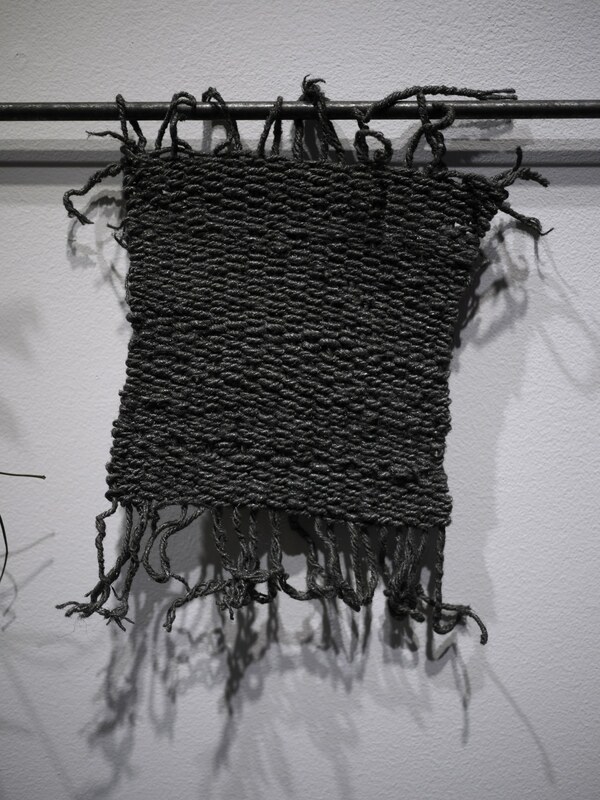 At the same time, this grouping recontextualizes the materials functionality as both an art object as well as modes of survival. 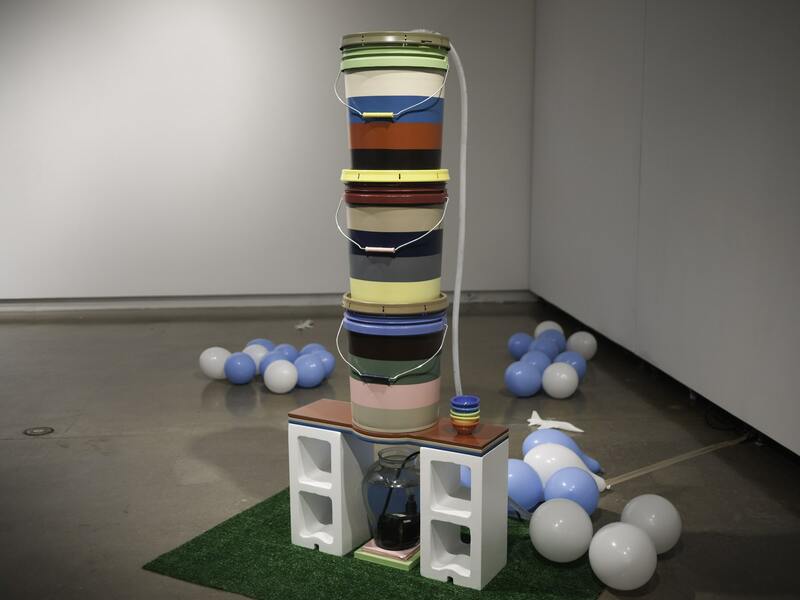 This gathering of objects attempts to erase the presumed intent of the materials giving them a new definition in their altered context as an artwork in their formalist arrangement. It becomes an aestheticized collection of material with layered functional intent. Not only does the ability to create and control fire make us uniquely human but so does the creation and admiration of the art object. In the preface of The Picture of Dorian Grey, Oscar Wilde writes; “We can forgive a man for making a useful thing as long as he does not admire it. The only excuse for making a useless thing is that one admires it intensely. 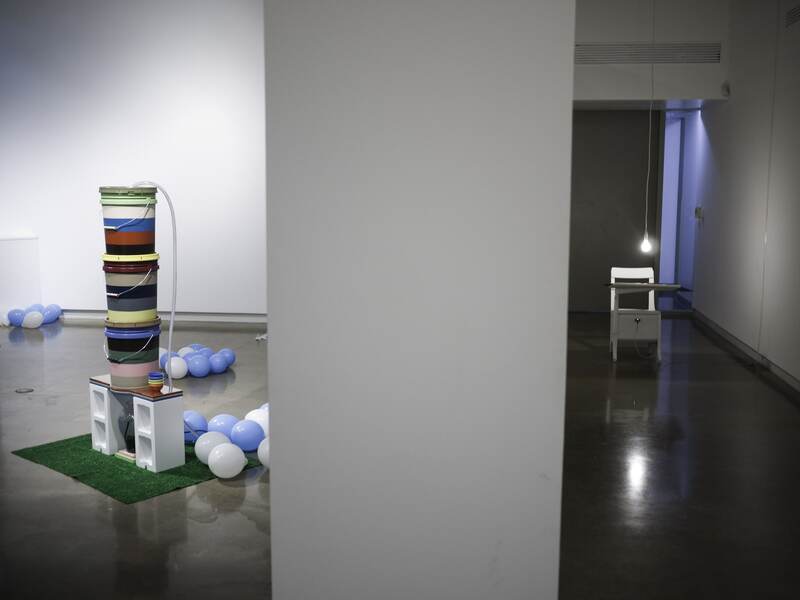 All art is quite useless.” Expanding on this definition of the art object, some of the pieces presented in the exhibition operate with a duel functionality. 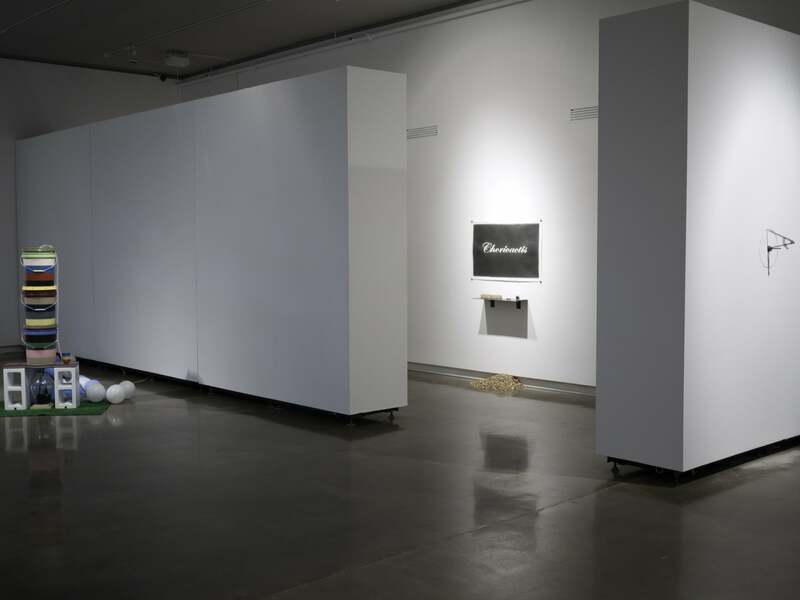 “Several Ways to Start a Fire”, as well as “Purification Station”, exist as art objects when a sustainable art market exists. All artwork relies on a market to establish the objects importance creating an economic system that helps fuel the art world. However, if that economic support was to fail—as in times of severe cultural and economic depression—these art objects would then serve as tools for survival. “Several Ways to Start a Fire” and “Purification Station” literally do just that, they provide a specific function for survival when needed. Survivalist trends have become part of the current pop-culture language over the last decade, partly due to a technologically driven world in which all of our basic needs have been packaged and delivered directly to us; the average person no longer needs to know how to hunt, plant crops or find clean water. Skills that were once a necessity for everyone have now become a romanticized specialty, or a hobby. This, along with a western ideology that the world is in constant danger of coming to an end. Fears of Y2K, the Mayan apocalypse, the rapture, Nostradamus’ predictions, and Planet X, have all dominated media headlines for years, becoming part of the current cultural zeitgeist. When a movement becomes a trend, and goes viral, it is quickly picked up by the consumer-based market place and packaged into a product. Popular television shows and media interest only perpetuate this trend. “Purification Station” acts as a literal representation of this packaged survivalist trend. This highly stylized interpretation of a basic water filtration system exhibits the commodification of an object. It was originally meant to be scraped together using commonly found items; buckets, cinder blocks, sand, gravel, and charcoal. By altering the cinderblocks and buckets to reflect a more contemporary pop aesthetic, it becomes something that could be bought at a retail outlet like Target. The object becomes a desired product rather than a purely functional device. The work is meant to open a conversation about the aesthetics of consumerism, and how the visual attraction of a product can influence public opinion of how well that product functions. Consumerism is based strongly in the science of attraction and seduction; the allure of an object, based on appearance alone, can be a much stronger force than the function of that object. This again goes back to our innate natural instincts, such as pea-cocking for attention, or using flare to stand out in a crowd. By acquiring an object of desire, the individual elevates their own personal level of desirability, which in turn, raises their status within the group. This desire to obtain power has been co-opted by a product driven economy that confuses “want” for “need”. Objects of survival also quickly move from function to decoration as we adorn and ritualize the things most important to our daily life. While walking through Walmart one day, I saw a group of about six people staring at a very clever product promotion. Under a large sign that read, “Clearance—High Velocity Floor Fans—$34”, was a shiny, chrome fan, pointing straight up, on full blast. Hovering in midair above the fan was a large multi-colored beach ball. The beach ball is kept in place by Bernoulli’s Principle, which states that air that is moving at a high speed has lower pressure than still air. The air moves around the ball to create a pocket of low-pressure air. When the ball moves to the side of the pocket, it will be pushed back in, and the upward force from the air stream keeps the ball aloft. It is a neat trick that some recognize from their junior high physics class, or a children’s science museum. However, it was not the trick that grabbed my attention, it was the group of paralyzed consumers that had gathered around the display, they were transfixed. What was it about this simple action that not only commanded attention but was able to retain it longer than most people interact with an artwork at a museum or gallery? This made me wonder what would happen if the same device was redefined as an art object. Would it captivate an audience in the same way? Could it function as a Duchampian readymade when recontextualized in a gallery setting? Almost as if it was social experiment, and an attempt to answer these questions, I brought the beach ball and fan into the gallery. 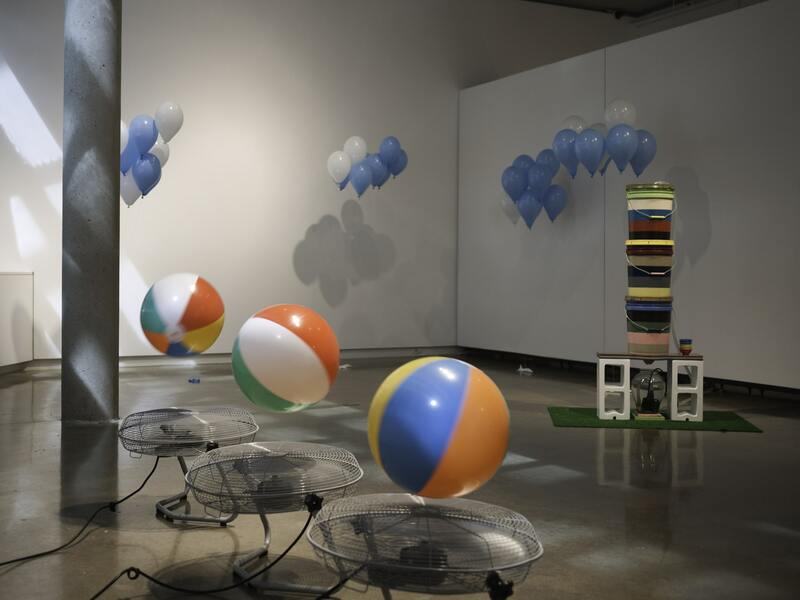 “Attention Retention”, is three floor fans placed in a row, each levitating a 16” beach ball. The three balls danced in a constant rhythm above the fans, creating a colorful space of repetitive action, it was hypnotizing, not only in retaining the gaze of the viewer but demanding attention from the audience. In a world dominated by media saturation, fast moving technology, and a constant consumption of information, an individual’s attention has become a highly sought after commodity. According to a November 2008 study by Lloyds TSB insurance, the average attention span has fallen to just five minutes, down from twelve minutes just ten years prior. This decline in attention is changing everything from our approach to education to how businesses market products. 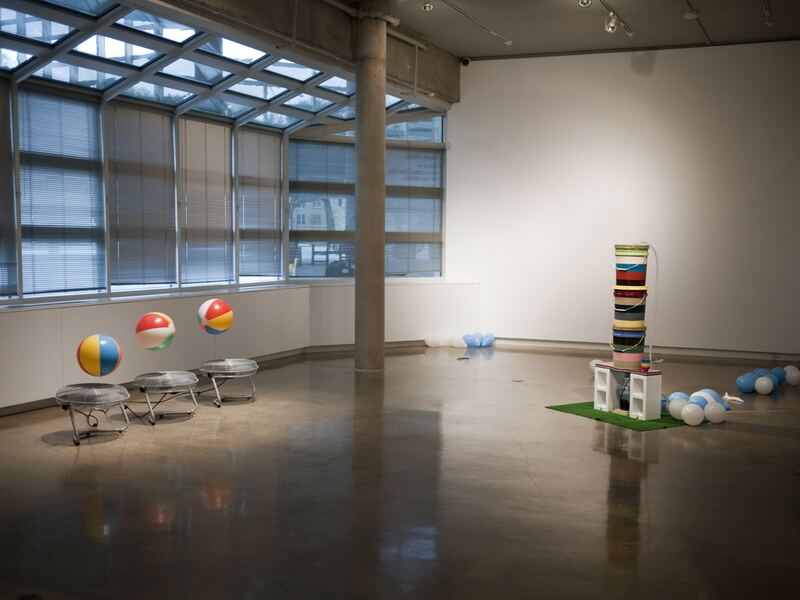 When an object like “Attention Retention” is placed in a gallery it creates a constant distraction for the viewer and alters the experience of the entire space. By interjecting a constantly moving object into a static space, the movement becomes a seduction. Even when the viewer is not interacting with the object directly, they are still constantly aware of the movement; keeping it in the periphery, or stealing a quick glance. This again is an effect of a naturally developed behavior, our brain sees movement in an otherwise quiet space and singles us to be aware and responsive. To our brain, this movement means one of three things; danger from a predator, a possible source of food, or a potential mate, again, it is all about survival. Survival can sometimes be nothing more than a game of endurance. The one that overcomes the struggles and refuses to surrender will be the strongest in the end. The simple, repetitive movements of the beach balls, not only create a device for capturing attention but also anthropomorphizes the object. By giving an otherwise inanimate object life and character, we begin to relate to it on a personal level. This response was most obvious with the piece “Escape Plan”, a simple drafting compass in a perpetual state of rotation. The compass was fastened to a metal rod that was driven directly through the wall of the gallery, on the opposite side of the wall was a small rotisserie motor that would revolve 360? every thirty seconds. Using a spring and bearing system on the rod, the compass was constantly being pulled into the wall as it rotated. Over time the sharp metal end of the compass dug a circular groove into the gallery wall, slightly deepening with every rotation. Given enough time, the compass would eventually cut all the way through the drywall, completing this pointless task. “Escape Plan” is a demonstration of the power of repetition, not only in art but in life as well. No matter how simple and insignificant a gesture may seem, given enough time and endurance, that gesture can accumulate to a significant impression. The ability to simply endure, both physically and psychologically can sometimes be all that is needed to preserver. Occasionally, as the compass rotated, it would get stuck in its crudely etched path, causing it to hesitate in its motion. This struggle evoked an emotional response from the viewer, it became a relatable experience that the viewer began to empathize with. Our proclivity to care of the weak, the ones that cannot endure, helps keep our species thriving. Sometimes survival is based purely on chance and seemingly unpredictable events. “Transpacific (a line drawn from Texas to Japan)” was created for an exchange program between Texas Christian University, and Hiroshima City University. I used 194 pencils to draw a continuous line on a single sheet of paper. The average pencil can draw a straight line for 35 miles, or so the legend says — it’s hard to confirm if this has ever been tested. All the graphite in the pencils theoretically contains 6,790 miles, the distance between Fort Worth, Texas and Hiroshima, Japan. The word Chorioactis was masked out on the paper, and left clean. Chorioactis is the Latin name for a mushroom that is commonly known as the Devil’s Cigar or the Texas Star in the United States — It is actually the state mushroom of Texas — while in Japan it is called kirinomitake. This extremely rare mushroom is known for its unusual appearance and disjunct distribution; it is found only in a few isolated areas in Texas and Japan. The work was displayed including every piece of the original 194 pencils; broken tips, shavings, and the remaining pencil ends that were sharpened as far down as possible. The Chorioactis’ presence in Texas and Japan reflects the distance traveled by the mushroom’s spore cloud between the two countries and is mirrored by the movements of my hand. Just as the compass in “Escape Plan” repeated its path in an indefinite loop, my hand made simple, continuous marks until every pencil had been used up. Over time these gestures wove a dense pallet of dark grey graphite. Chorioactis has survived by relying on random actions; the wind, and chance; the wind’s direction and the chance release of its spores. 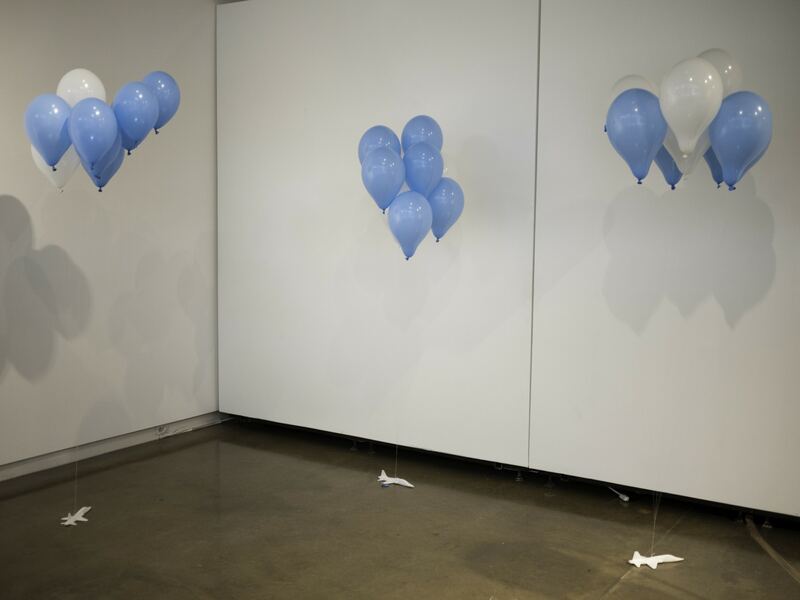 The last two pieces in the show were grouped into one site specific work that operated as a commentary on the show itself. “. . . best idea ever!”, and “Reference Desk”, both spoke directly to the ideas of the exhibition and the implied lines between the works. Both pieces reflect a curiosity and an exploration of the unknown, two forces that constantly progress our culture and the understanding of the world we occupy. “. 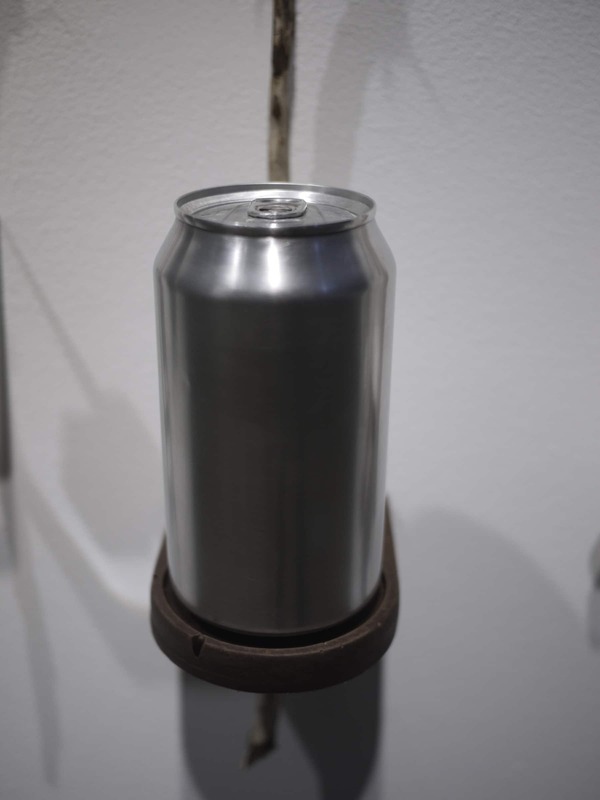 . . best idea ever!” has been installed in different locations in previous exhibitions and carries different implications depending on the environment in which it is viewed. A bare 25-watt incandescent light bulb hangs from the ceiling, at eye level to the viewer. The cord is attached to a motor-belt in the ceiling that is wired to an ultrasonic motion sensor that reads the approach of the viewer. Depending on the distance of the viewer, the motor shakes the light bulb back and forth, increasing in speed, as the viewer approaches. The bulb itself is the “best idea”; the hard to obtain, always moving, difficult to grasp, right in front of your face, idea that solves everything. The first incarnation of this piece was hung in a men’s restroom directly above the center of the toilet, gallery patrons using the restroom were forced to interact with the bright light as it shock uncomfortably close to their face. For the installation of For a Limited Time Only, the bulb was hung directly over “Reference Desk”, a literal school desk with reference material splayed out on the table for visitors to read. The three colored folders of reference material are a collection of index entries from various books that have influenced my artistic practice. Viewers were invited to sit in the school desk and make connections in the material, while dealing with the constant distraction of a blinding light. Sometimes it is difficult to grasp “the idea”, but this is essential to building a progressive culture and society. Since almost every action we take and decision we make can be traced back to the instinct for individual preservation, we may need to slow down and look back at where we started. At our core, we are all still animals who are still controlled by instinctual behaviors, but we are also unique, in that we live by a self-imposed moral code. The ability to analyze our actions and predict their outcomes gives us a great advantage, and has made us super-survivors. However, if we do not question the long-term effects of the paths we are making we will fail to maintain a sustainable system. 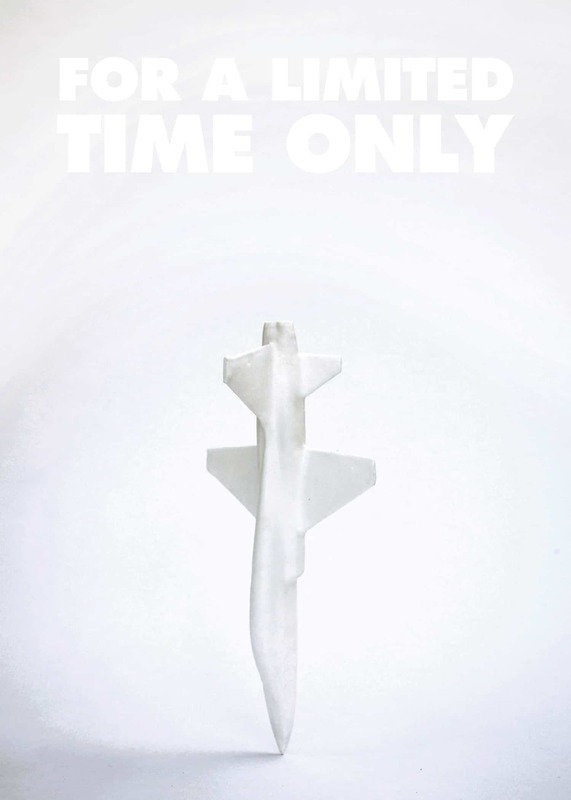 As the title of the show suggests, the individual is only relevant for a short time, it is the actions of the individual that will resonate long after they have past. 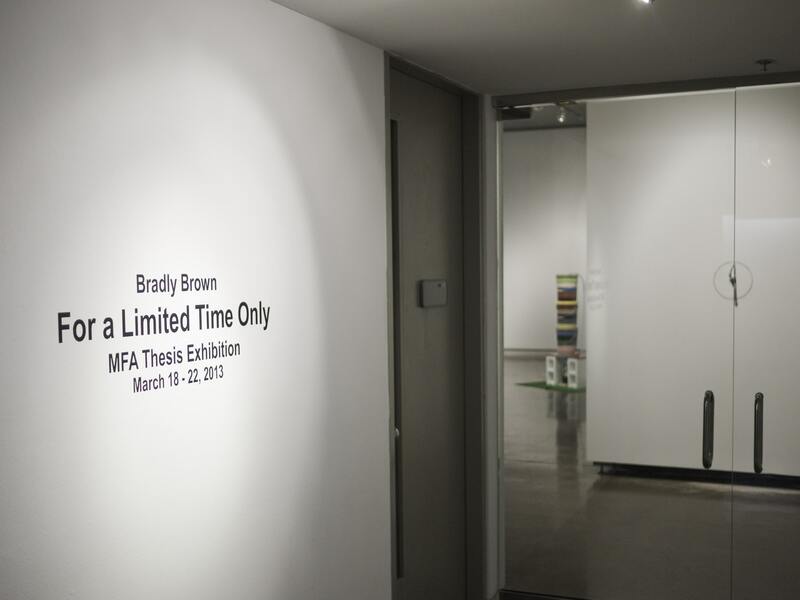 May 22, 2014 | Filed under ARTWORKS, DRAWING AND PAINTING, EXHIBITIONS, SCULPTURE and tagged with artist, bradly brown, bradly brown artist, cast, found object art, installation art, sculpture.